Understanding Risk - Gambling or Insurance? Miami Business School hosted "Understanding Risk - Gambling or Insurance?" featuring Brian Duperreault, President and CEO of AIG, a leading global insurance company with operations in more than 80 countries and jurisdictions. The event was held as part of Southern Glazer's Distinguished Leaders Lecture Series in Storer Auditorium on Tuesday, February 5. Duperreault began his career in insurance after serving in the United States Army. In 1973, he joined a shabby “startup” called American International Group as an actuary. After leading ACE, Marsh and most recently Hamilton Insurance Group, Duperreault returned to AIG in 2017 as its president and chief executive officer (he prefers the title “Professional Gambler”). Throughout his impressive career, he has placed his bets on the power of people and talent. When addressing the insurance industry’s future, he spoke about the advantages of investing in human talent, despite the growth of InsurTech companies looking to disrupt the industry using automation and artificial intelligence. Following the lecture and audience Q&A session, attendees were treated to a cocktail and networking reception where AIG recruiters were available to meet with students. 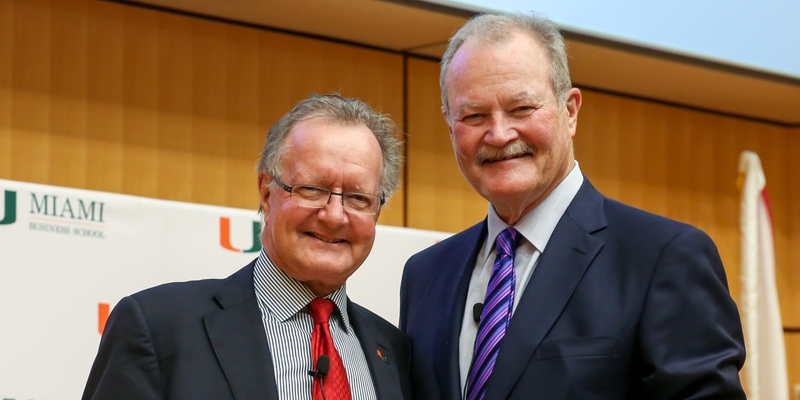 Southern Glazer’s Distinguished Leaders Lecture Series brings students, alumni and other members of the UM community together with top business leaders throughout the year. To learn more or for a complete schedule of upcoming special guest lectures, click here.